This lightened-up version of chili, made with ground chicken or turkey, is packed with the best of summer's bountiful vegetables. Serve with a spoonful of yogurt or sour cream and chopped fresh coriander, parsley or chives. In large saucepan over medium-high heat, cook turkey, onion and garlic until turkey is browned and onion is soft. Add tomatoes to turkey. Using sharp knife, cut corn kernels from cobs. 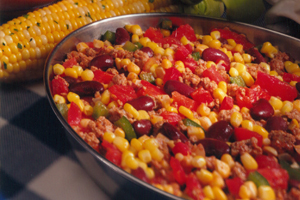 Add corn, red and green pepper, kidney beans, chili powder, oregano, cumin, salt and vinegar to turkey mixture. Bring to boil, reduce heat and simmer 15 minutes. Pour boiling water over and let stand 2-3 minutes. Immediately plunge into cold water. Skins should come away easily.